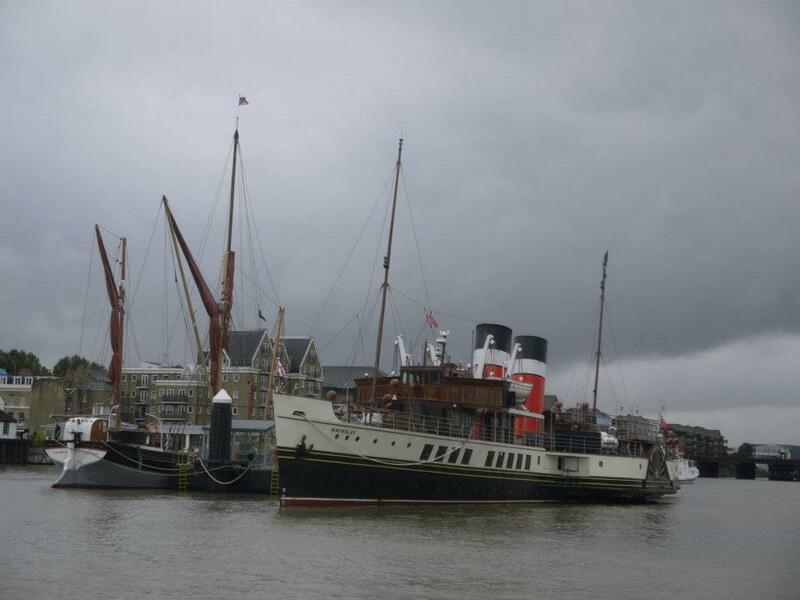 Photos of the paddle steamer Waverley, when she was doing trips on the Thames last year, have just been published on the vessel’s Facebook page. Amongst them is this terrific one showing Waverley and sb Cambria on either side of the new pontoon at Gravesend. When Waverley came into the pontoon for the first time, with a ribbon-cutting ceremony and a brass band playing on the pier, I was on board Cambria with Dave Brooks and Rob Bassi. We had been expecting quite a few Waverley passengers to visit Cambria and were all ready to show them round. In the end only two were given permission to disembark from the paddle steamer and come on board, and they were only allowed five minutes. A high speed tour took place! Still it was great to see these two ladies of the sea side by side, and a stirring sight when those huge paddles turned and Waverley continued up river. Dave Brooks took this striking picture on 28th July, after the 2012 Thames Match. It shows some of the barges lying off Gravesend late at night. They are at peace after their sail out into the estuary; then being becalmed; and the eventual abandonment of the Match. 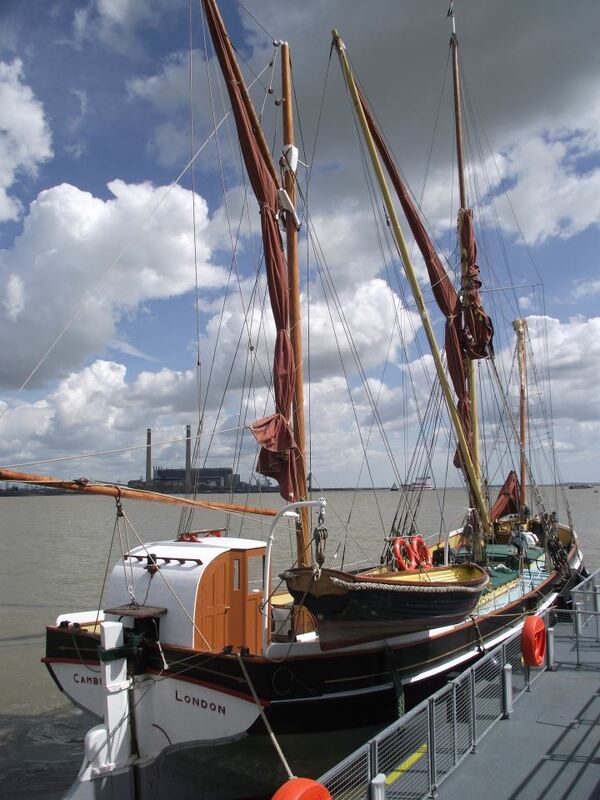 Wednesday 1st August: Talk – Evolution of the Thames Sailing Barge by Richard Hugh Perks. Talks at 3.30pm and 7.30pm. Admission £4.00. Proceeds on behalf of Cambria. Thursday 2nd August: Talk – The Story of Lifeboats and the RNLI by Tricia Gurnett . Talks at 3.30pm and 7.30pm. Admission £2.00. Proceeds will be shared. Friday 3rd August: Talk – 200 years of the Thames and Medway Canal. Talks at 11.30am and 3.30pm. Admission £2.00. Proceeds will be shared. 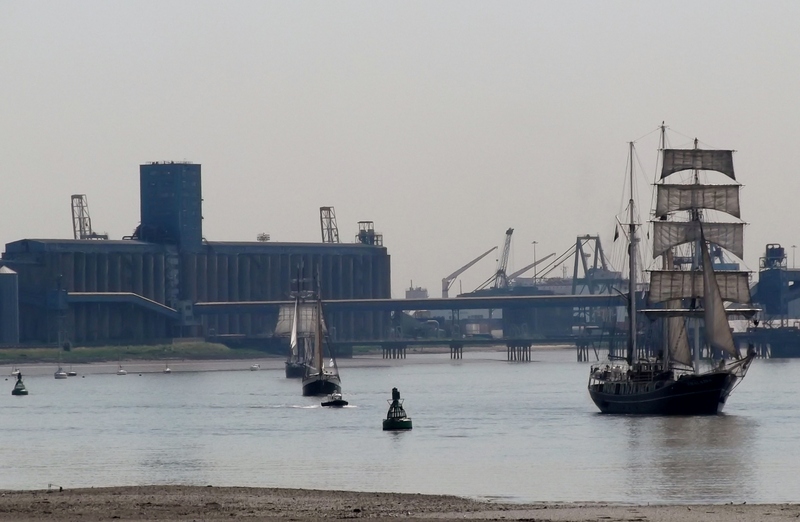 Heard quite by chance that a flotilla of 14 tall ships was going up river from Tilbury. They are to provide short sails on the Thames in London during the Olympics under the banner Sail Royal Greenwich, and gourmet catering is promised plus a view of all the London sights. 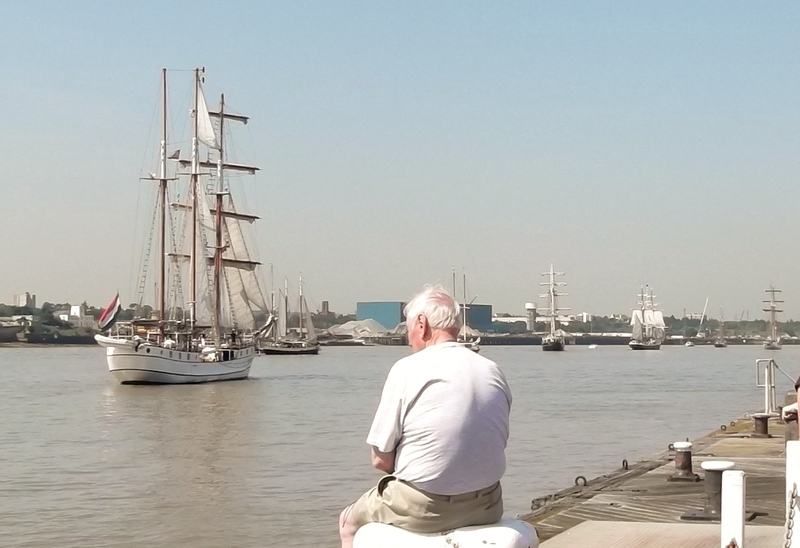 Normally when I go to Tilbury Landing Stage for such an event, there are only a few hardened watchers there, but this morning, driven no doubt by the school holidays and the excellent weather, it was packed. People everywhere; the ferry passengers had a great view; and over there at the new Gravesend Town Pier pontoon was a lady I thought I knew – a grey and black lady with fresh paint. Cambria back ready for the Thames Match on Saturday. 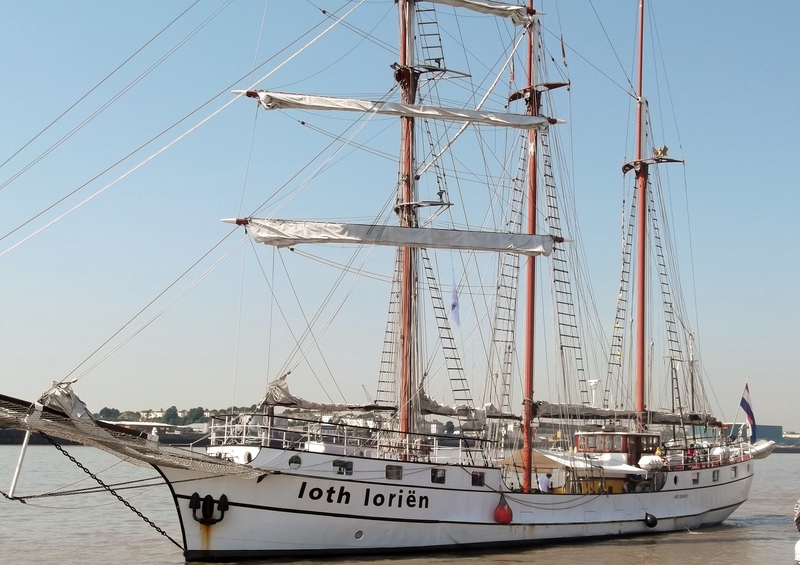 The tall ships were moored at Tilbury Landing Stage overnight, and took passengers on board this morning, who, we were told, had been brought down river by Thames Clipper. 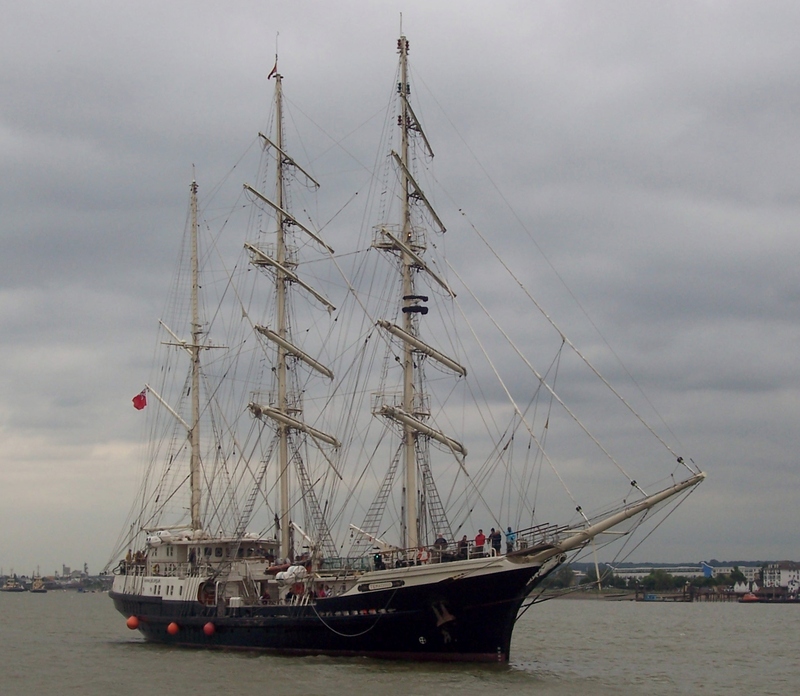 They left the landing stage under motor, but soon the sails began to unfurl. 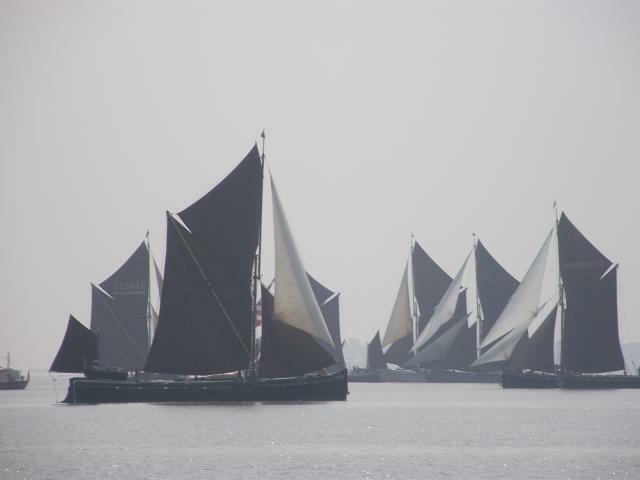 Then, on a sparkling sunny morning, they formed up into a wonderful stately parade of sail for the journey up to Greenwich. Standing on the landing stage, unfortunately I was facing straight into the sun so the pictures I took are darker than the beautiful day would have suggested. Once the sails had disappeared behind Tilbury docks, I raced by car back to Grays and down to the riverside by the old Wouldham works. I missed the frontrunner, but was in time to see all the rest as they came past. It was low water, so they had to be right in the middle to pick up the channel. And luckily the huge Cobelfret ships stayed well back until the parade had passed. Then they were gone. The Sail Royal Greenwich website here tells you all about what the ships will be doing, and also mentions that today’s sail had to be curtailed. They were not allowed to go right to Greenwich for security reasons, presumably Olympics security. A friend tells me it was disappointing earlier as the river front at Greenwich was packed with people who had come to watch, but the ships had to turn back. Tonight though they eventually made it to Greenwich. 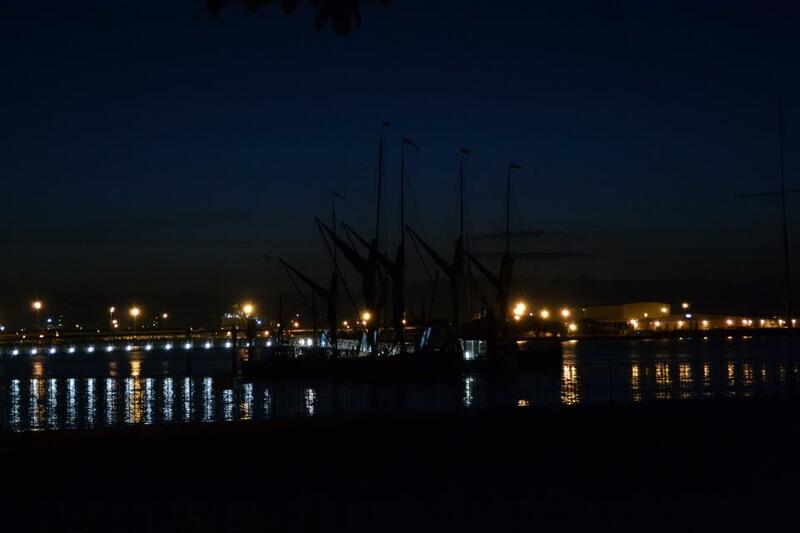 I went down to Tilbury Landing Stage on Thursday evening because Cambria, lying at the new Town Pontoon at Gravesend, was to start her journey up river ready to join the Avenue of Sail for the Diamond Jubilee River Pageant on Sunday. It was a dull evening with slight rain, but, with the car on the landing stage, I was able to stay in the dry and just get out when Cambria was ready to sail. She slipped her moorings at 18.05 and began the first tack across the river. She looked tremendous. Two tacks later, and she was near the Tilbury Landing Stage. I could see everyone on deck, and identified Julie. I had said I would wave a Union flag, which I did madly, and Julie says she could see me. And then they were gone, hidden by the massive cargo ship moored at the far end of the Landing Stage because she’s too big to get into the Docks. Meanwhile, more treats appeared. 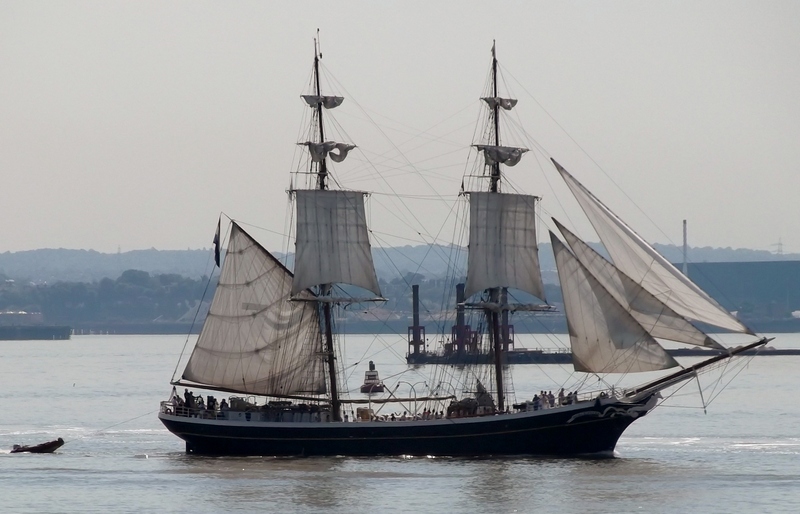 First, the magnificent Tenacious, owned and operated by the Hampshire-based Jubilee Sailing Trust, a charity that promotes the integration of able-bodied and physically disabled people via the challenges of crewing a square rigged tall ship at sea. As she approached Tilbury, a rib left the ship with six young people in yellow waterproofs who climbed on to the Landing Stage. They found the deputy harbour master – that was lucky, usually there’s never anyone there when you want them – and he said Tenacious could tie up at the far end. Shortly afterwards a little grey motor boat appeared, followed by three sailing vessels. The grey job was MTB 102, now in private ownership but built in 1937 as a motor torpedo boat able to mount a quick response to threats from both warships and submarines. She saw active service mainly in the English Channel. During ‘Operation Dynamo’, the evacuation of the British Expeditionary Force from Dunkirk, she crossed the Channel no less than seven times. In 1944 she carried Winston Churchill and General Eisenhower to review the ships assembled on the South Coast for the D-Day landings. So she saw both the end of the desperate evacuation of the British Forces from Europe and the start of their determined return. The next sailing vessel was the Jolly Brise, a 1913 Pilot Cutter. 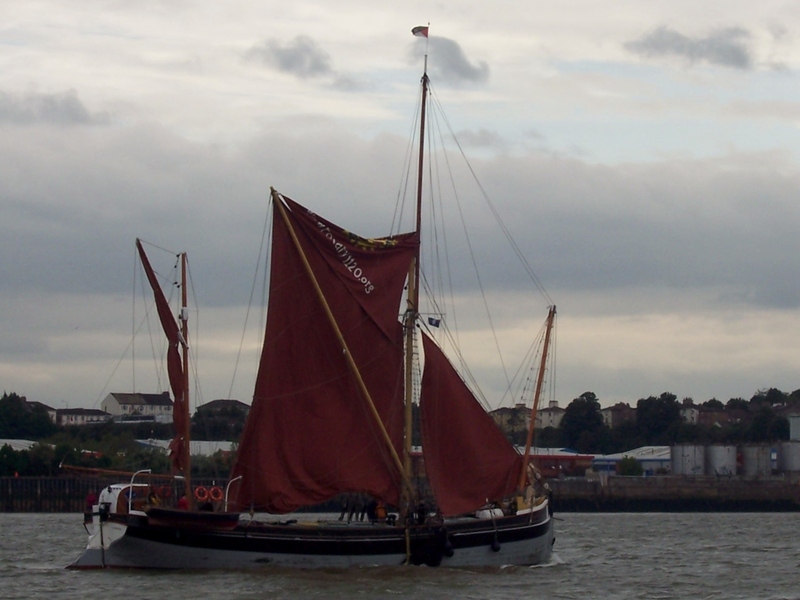 She is the only traditional vessel in the UK owned, maintained and sailed by school students. She won the first ever Fastnet Race and then two more after that. In recent years she was the overall winner of Tallships Races 2000 and 2004, being raced and sailed by Dauntsey’s School Students. Dart, and at 90ft long is one of the medium-sized ‘mule’ class of sailing trawlers. The Brixham sailing trawlers were legendary deep sea fishing vessels, their design combining strength and stability with manoeuvrability and speed. 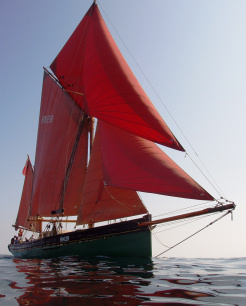 Provident is one of only a handful of these famous vessels still in use and is now operated by the Trinity Sailing Foundation for sail training and sailing holidays from their base in Brixham. originally named Else, after the Captain’s daughter. She traded as a cargo vessel around the coasts of Denmark and Norway, initially as a motor sailor, but after 1956 under motor alone. By the 1970s she was no longer needed, but in 1983 she was bought by The Cirdan Sailing Trust and went into service renamed Queen Galadriel. Now the Trust’s flagship, she provides disadvantaged young people with learning opportunities and self development through the challenge of life at sea. So well worth the scramble back round the M25, actually completed in record time, to see not just Cambria but other vessels taking part in the Jubilee Pageant. The MTB will be in the flotilla accompanying the Queen. 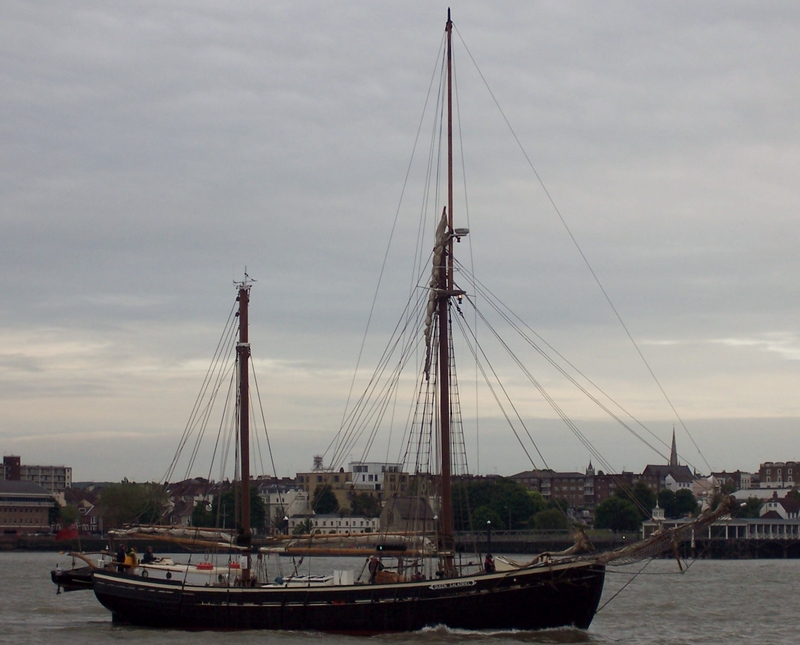 The others will be in the Avenue of Sail: Queen Galadriel and Jolly Brise in St Katherine’s Dock, and Tenacious and Provident moored below Tower Bridge on the south side of the river. Cambria will be moored between Tower Bridge and London Bridge, also on the south side, amongst a good number of her fellow sailing barges. The Barge Blog has been so busy that there was no time to publish Dave Brooks’s winter report from Cambria earlier, but here it is. “It has been a busy close season for the Cambria. Many of our objectives have been achieved, though some will have to carried forward to next year. “The main focus of this close season was to have the Rotary Club Logo painted into the tops’l, (Rotary International is a sponsor of Cambria), which has been completed, and to replace our old ‘whippy’ bowsprit, which has been fitted. 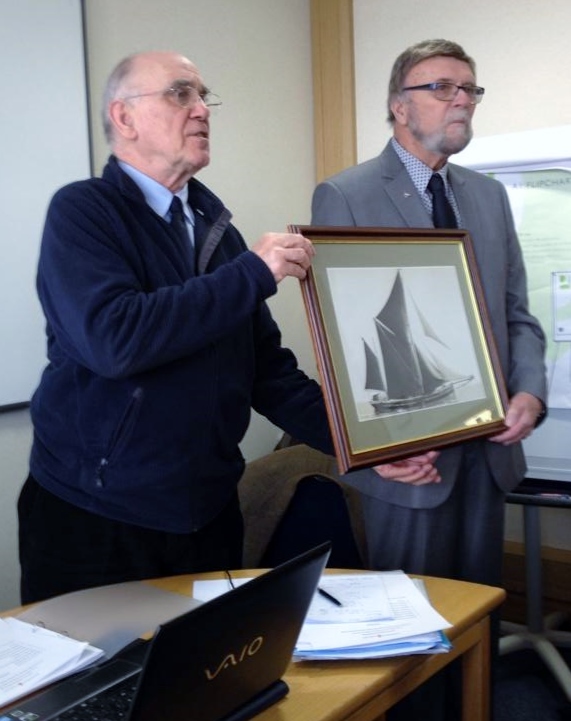 “Sailing plans started with Cambria leaving Faversham on Friday 20th April, under Richard Titchener, and arriving in Gravesend on the 22nd to sit on the new pontoon at Gravesend Town Pier as part of its opening event. We had the barge open to the public as much as possible, although the weather didn’t do much to encourage visitors. 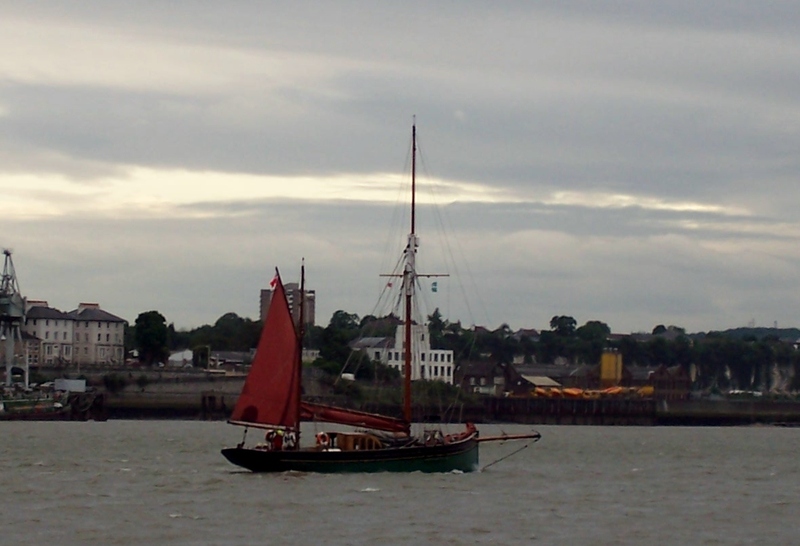 She left Gravesend on the 4th May to return to Faversham where her re-dedication ceremony took place on Standard Quay on the 9th May. “We expect to be racing in the Medway Match on the 26th May, the Thames Match on the 28th July and the Colne Match on the 8th September. Photo by Dave Brooks shows Cambria lying at the Gravesend Town Pier Pontoon, and yes, Matt C and Jeremy T, that is the power station!